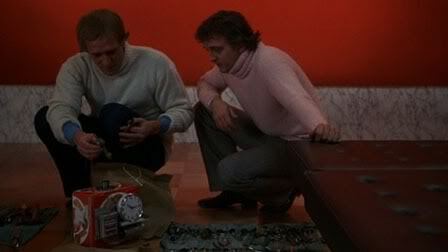 i discovered 1974’s juggernaut while looking for die hard clones. i thought it would be nice to do one from the b.m. era, b.m. as in before mcclane. it’s a british movie from the director of superman ii and iii, starring dumbledore, hannibal lector, doctor zhivago, and bilbo. the simple and timeless premise would be familiar to any moviegoer: a madman planted seven bombs on a luxury cruise ship. he called himself juggernaut. if he is not paid, the bombs will explode and killing the 1200 people no board. richard harris plays the bomb expert sent to the ship to defuse the bombs. the ship, as you can see on the poster, is unfortunately named the britannic. at least they didn’t name it titanic ii. it’s more of a disaster movie than a die hard type action movie. that’s not really surprising since it was released a few years after airport and the poseidon adventure, and the same year as the towering inferno. what’s often overlooked is the disaster movie elements in the original die hard movie made 14 years later, but the action and john mcclane characteristics are what most people remember. 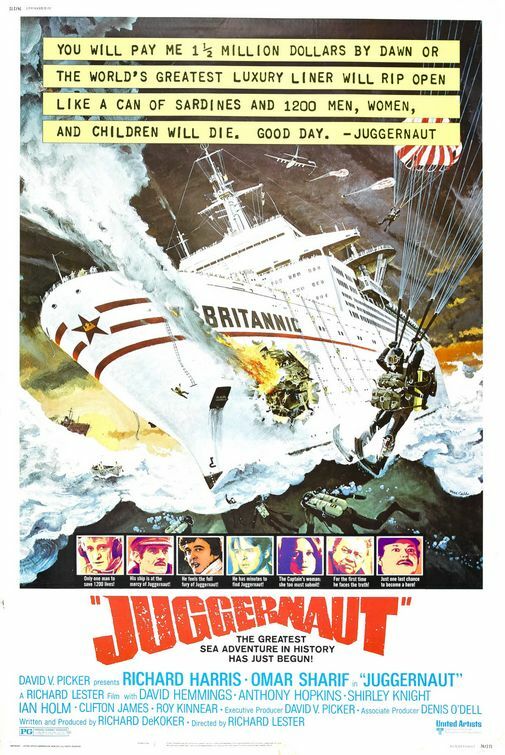 all the pre-requisite elements are there in juggernaut: the opening of the passengers boarding the ship, the quirky and quick introductions of a selected few passengers (though still not as tedious as speed 2), the madman’s demand (ripped off by speed 1), the here’s-an-example-of-what-could-happen-in-a-smaller-scale sequence, the personal stake (anothony hopkins’ police officier is not on the ship but his wife and kids are), …etc etc etc. so all the pieces are there for a formulaic popcorn movie. but the movie as a whole, after 37 years and many variations later, still has its uniqueness. with richard lester’s direction, who also directed two beatles movie, there is an overall sly mood where instead of melodramatic, it goes for the cool and the detached. there’s a surprisingly lack of yelling for a disaster movie. 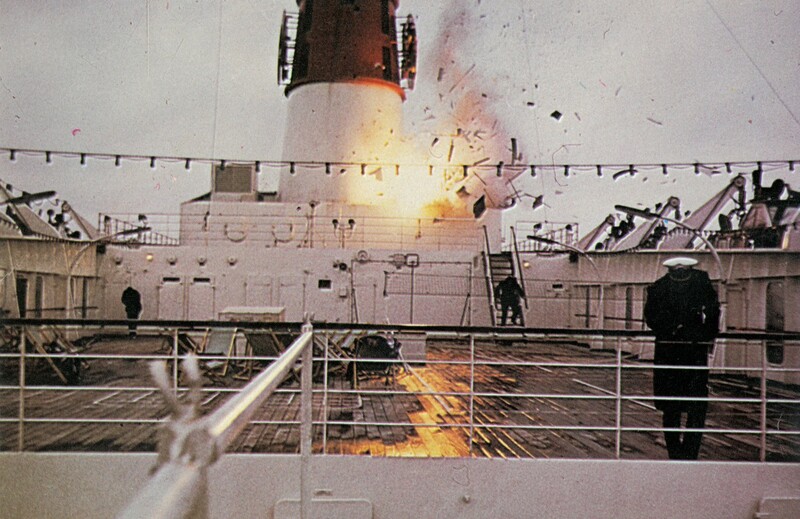 i don’t know if it’s a british thing or a 70s british thing, but when the passengers are informed that there are bombs on the ship, they seem rather cool and logical. even the american passenger acts rather low-key. it’s a nice change to the hysteric and bombastic we usually see in this type of movies. another nice touch is that they didn’t make him into an ugly american abroad stereotype. there are also plenty of offhand/overheard one liners that make you think that no one is taking the whole thing seriously. my favorite would have to be the scene where hannibal lector’s kid, who received a book about ships as a gift, said, “that flag means there’s explosive on the ship, fifteen points for me.” do ships have a little flag on board that signal that they have explosives? i guess it would be helpful for them to have, at least in movies. as interesting as the little touches and sidenotes are, the main course is only somewhat satisfying. the snapshots of the passengers are quirky but never quite draw you in and get you involve. it took about half an hour for the bad guy’s appetizer to show. richard harris’ john mcclane doesn’t get on the ship until about 50 minutes into the movie. after that it only gets moderately interesting with all the bomb defusing stuff. since it’s made in the 70s, i’m more willing to forgive the red digit countdown and the which-wire-to-cut bomb defusing scenes. technically it does stand up pretty well. the editing of those on land and the ship scenes are pretty well done. there are quite a few logical lapses in the main plot that take you out of the movie. hell even the madman villain seems calm, logical, and cunning compare to their overacting maniacal hollywood counterparts. i have to mention roy kinnear, who’s probably my favorite character as the ship’s social director. he made two titanic references and bombs or no bombs, he wants the passengers on the ship to have a good time with its regularly scheduled programs. it’s true, you don’t see that kind of job dedication, at least in movies, anymore. at first i had a problem with the passengers reactions to the bombs but on second though, since they are trapped on the ship, there isn’t really much they can do even if they freak out as they would in most disaster/die hard-ish movies. so it’s only logical that the “doomed” passengers started dancing. though richard harris’s character is not john mcclane, he does have his own mcclane-ness. he doesn’t get into any action scenes but they give him just enough details to make him a memorable hero. i personally love the fact that throughout the movie, he’s either smoking a pipe or having drinks. at one point he actually lit up a cigarette while defusing a bomb. i’m not sure what makes him the no. 1 bomb expert in britain, and the movie doesn’t care to let us know either but i’m more than happy to go along and accept that he just is. the pitch: die hard on a cruise ship (no-pun-in-title division). bruno, the mcclane surrogate: richard harris, and his bomb defusing team. the gruber factor: juggernaut. refreshingly, he’s only in 2-3 scenes in the movie. which saves us from the villain overacting. we only hear his voice, and we don’t find out who it is until the final act. the hans objective: ransom money. wrong place at the wrong time: richard harris isn’t really trapped on the ship, he’s so good as a bomb expert that he and his team are parachuted onto the ship to take care of the situation. so it’s more like passenger 57, executive decision, or speed 1.
the help: ian holm, as the cruise ship company head, wants to pay the ransom but anthony hopkins and the police want to catch juggernaut and not pay the money. the family element: anthony hopkins’ wife and kids are on the ship. bonfire of the weaponry: richard harris and his team brought their own bomb defusing equipments with them, in bright orange tubes. last man standing: there’s a little backstory between richard harris and juggernaut. but they never meet and only communicate on the phone. unbearables: it’s not an action movie like die hard. it’s on a ship like under siege, even though he’s not trapped on the ship. he’s not a reluctant hero like under siege, sudden death, or speed 2 but rather he’s the best man for the job, like passenger 57, the rock, or executive decision. between the bad guy’s motive and the premise, the speed series has pretty much ripped off everything from juggernaut. I’d recommend anyone catching Juggernaut if they see it in the schedules. It’s an interesting film. On the surface a bog-standard disaster film, but Richard Lester adds – as your review notes – a sly, different ambience to the whole film. It’s odd to see a disaster movie played out with downbeat mood rather than the hysteria that these films normally opt for.